Implementing this layered strategy has been shown to increase scores by 30 – 150 points. The physical therapy board exam questions are not there to trick you or be hard; however the types of questions seen are based off of real life scenarios. We emphasize seeing our NPTE practice questions as patients and applying clinical thinking to help them. What is on the PT exam is not going to be necessarily found in the textbook or study guides and Therapy Exam Prep (TEP) provides insight on thinking beyond the academic levels. 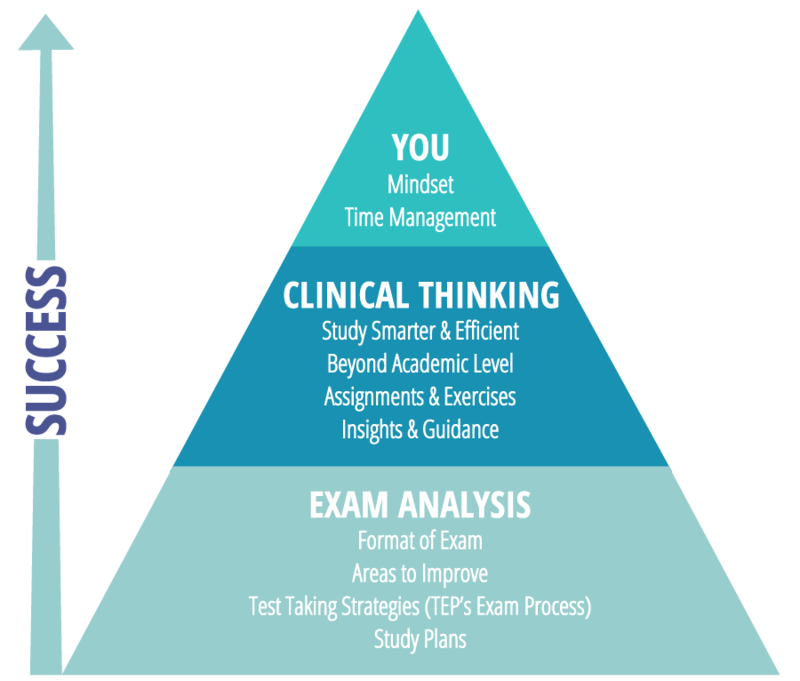 Compared to passive studying, TEP’s clinical thinking approach with assignments, study guide tips, insights, and exercises make for better retention of the information in a shorter period of time. What is learned now is remembered beyond the exam itself and carried over to patient treatment. One of the keys to passing the PT board exam is understanding the format, being able to analyze the questions, and as a result becoming a better test taker. TEP has developed a systematic way of designing your individualized study plans for a smarter and more efficient way to prepare. When treating a patient, you are to treat the whole person and not just the condition. TEP is the only PT exam preparation to implement this concept and addresses you, the examinee, as a whole. There are many factors that can affect scores and TEP addresses the different areas. TEP provides help in improving confidence, decreasing stress, and time management skills.